While others talk a good game, Redhill Farm Free Range Pork near Gainsborough, Lincs, play a good game. They farm their pigs, butcher the pork, make the pies, haslet and sausages, and sell directly to the public at local farmers’ markets. There are no middle men. No corners are cut. No little white porkies are told. They don’t claim to source “the vast majority” of their pork locally “where possible”, because it’s all from their own fields. It’s an impressive way to operate, and their customers – including Jamie Oliver – appreciate it (Jamie chose Redhill Farm pork pies for his Fabulous Feasts catering arm, which supplies Lord’s Cricket Ground). And Redhill Farm’s farmers’ market regulars are loyal to the last, coming out in all weathers to get their fix. I went to see Redhill Farm’s husband and wife team Jane and Terry Tomlinson a couple of weeks ago with my wife and three-year-old son. Jane and Terry have spent the past two years building a seriously impressive new farm shop and food production facility on their farm. If you haven’t visited, I thoroughly recommend it. 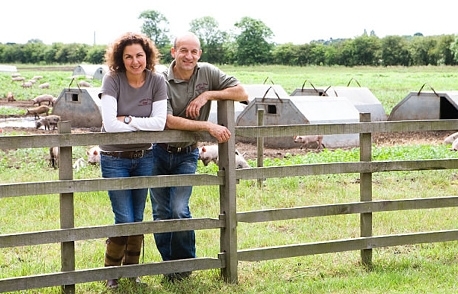 Having looked around the farm and spoken to Jane and Terry at length, it’s clear they are doing everything they can to produce the very best ethically farmed pork. That puts the onus on us as customers to support producers who go to such lengths to provide genuinely high quality, ethically produced food for our tables. The temptation to buy supermarket meat supplied by industrial farming methods and often-untrustworthy middle men (remember horse meat?) is always there. I often succumb during the daily rush to beat the clock. But I – we – must try harder and consistently support ethical producers who focus on quality rather than quantity, especially when it comes to meat. If we don’t, where will it leave us?